The top 5 promotional product categories are apparel, writing instruments, bags, calendars and drinkware. 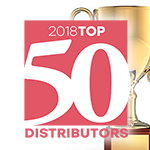 Promo Marketing has ranked G&G Outfitters number 15 among their 2018 Top 50 Distributors List! It is because of your client partnership, that we have achieved an increase in our ranking since last year. Throughout every customer interaction, G&G is committed to deliver the Perfect Client Experience. With our accurate and timely communication, attention to detail, innovation in technology and continual process improvement, the people of G&G Outfitters create a dynamic organization that strives for Exceptionalism. G&G's Co-founders Rich Gergar and Doug Gardner thank you for the continued support and privilege to be your Branded Merchandise Partners!